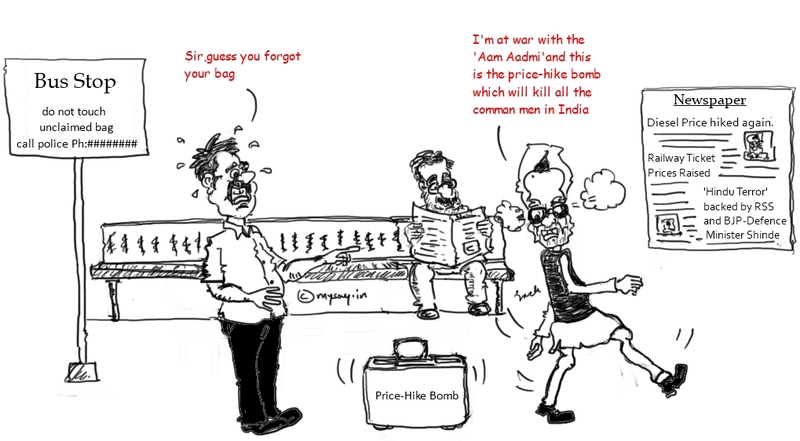 Price-Hike Terrorism against 'Aam Aadmi' backed by UPA Govt ? While, External Affairs Minister , Salman Khurshid and Digvijay Singh of Congress seem busy defending Union Home Minister,Sushil Kumar Shinde’s statement that training camps of BJP and RSS are promoting hindu terrorism and justify his statements,the biggest terror in India and for the common man of India (Aam Aadmi) is continuous price-hike.The bomb of price rise in petrol and diesel has been quite frequent and has automatically raised prices of basic necessities of living.To add on, the LPG cylinder numbers are capped( for subsidized rate benefits) and now the Railway Ticket Fares are also raised. Haha but the government has no option but to hike prices. I am in the UK now and I sometimes wonder how cheap things in India are, in comparison. 1 Liter milk costs 90 Indian rupees here in the UK. Of course the standard of living is different but still things are really cheap in India. I am never going to complain about the price of things in India anymore. 😀 the only issue with India is uneven distribution of wealth…poor is very poor rich is filthy rich ….and the middle class – the aam aadmi is the one suffering the most imitating the rich and scared of the lifestyle of the poor . 🙂 thanks for dropping by .